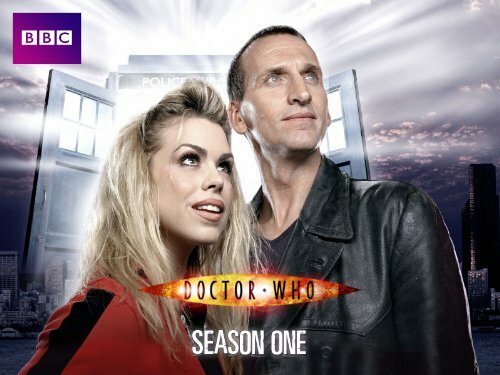 The 9th Doctor and Rose continue their dark journey through WW2 London, and we learn that not only is a Captain Jack Harkness a (wannabe) conman, but he may in fact be responsible for the Gasmask Zombie epidemic that is raging on the ground while nazis bomb the city from above. So now our three time travellers set off to find patient zero, the O.G. (Original Gasmask), determine who has the biggest sonic, solve the mystery and save the world from the creepy little boy who just wants to find his mummy. This is the second and concluding part of a two-parter that started with N009 The Empty Child. Undoubtedly, the best scene of the episode. Nanogenes presumably trying to work out what part of their coats is hereditary. Captain Jack trying to keep the massive cylinder twixt his legs from going off. A creepy child telekinetically controls toy monkeys and makes gas masks grow out of people's faces, and we meet Captain Jack for the first time! So after just writing my Ark review, this story is the perfect counterpoint, displaying exactly what Doctor Who should be. #1: Fun. This two-parter just basks in the idea of being a Doctor Who episode. Maybe it’s because it’s Stephen Moffat’s first episode for Who, and you can just feel him relishing it. Rose hanging from a barge balloon in WW2 Blitz, hell why not? Playful banter between The Doctor and Rose (and not only that, but fantastically written, intelligent sexual metaphors, that get at the relationship of the two). The hilarious cliffhanger resolution that pokes fun at the whole idea of having one in the first place. Running around a hospital with bananas and square guns, it’s just so damned fun! #2: Scary. The Child is just plain creepy. The way he repeats the same, horrible phrase that just brings home all the horror of WW2-era Britain. Gas-masks have always looked especially creepy on children anyway which adds to the effect. The glitchy way he controls objects to call out for an answer. The amazing scene where the tape runs out and he’s revealed to be in the room with the TARDIS crew. #3 Progressive. This is exactly where The Ark went wrong. The Doctor here represents the future, and his comments on future humans, going out into the starts and ‘dancing’ is just a great idea. It’s such a human thing and it feels right we should be spreading the love with other species eventually. Sexual Repression is just a bad thing for a society to have, and here we see it in Nancy. She can’t admit to being the mother of her own child because she had him young and out of wed-lock. The most human thing, a mother’s love, is repressed; so what’s the resolution, Nancy meeting the ‘monster’ of the story and telling it ‘Yes, I will always be your Mummy’. The Doctor hasn’t just saved lives, he’s bettered this family’s life. We also get it with Captain Jack, openly, at least here, bi-sexual. Expressing interest in Rose as well as Algy. Is it condemned? You bet it isn’t, just as it shouldn’t be. #4 Good writing. The Nanogene’s are naturally brought into the plot, becoming important later. The gas-mask zombies are well revealed, their scars and flesh another clue in the overall plot while we also get creepy zombie monsters. On top of this great dialogue: The whole ‘dancing’ metaphor, The Doctor’s reaction to the TARDIS ringing phone, “I’m not sure if it’s Marxism in action or a West End musical”, “Those would have been terrible last words”, and of course, the beauty of the war-torn, PTSD 9th Doctor being able to say “Just this once, everybody lives”. It’s another great moment in Series 1 that just encapsulates the joy of life, the mother is reunited with the son, the lady with a war injury is cured, the roguish Captain who sacrifices himself is allowed to live for his good deeds, The Doctor and Rose dance. I was gonna give this a 4.something, but I don’t care , this story deserves a 5.0. Minor faults be damned! Going back for a moment to my personal story from my Empty Child review. I had inadvertently traumatized out my two younger nieces when they saw parts of this episode thanks to the Child. Fortunately, I am a total spoiler hound and already had an idea of how this episode ended on “Everybody Lives.” So I made it a point to make sure they saw the conclusion of the episode, too. To date, all three of my nieces enjoy Doctor Who to varying degrees, and are a bit older now and can handle the tougher stuff. Though I do have to be mindful of which episodes I watch with the younger ones (now 11/12) around. For the two younger ones among their favorites is Tennant’s “The Girl in the Fireplace”, the eldest niece (who already likes horror and suspense) considers the Weeping Angels her favorite Doctor Who monster, and as of this writing I plan to take my two younger nieces with me to see “Deep Breath” in the movie theaters. Now on to the episode proper. First of all, where else but Doctor Who would you see the hero survive a cliffhanger by demanding the threatening monster go to its room? Where else would you see a hilarious and awesome moment also come back and bite the heroes right in the backside? Also, Nancy is awesome in how she handles the Man of the House and basically blackmails him into letting her go (with gear for her plan, too). The threads from the previous episode come together as, just as Dr. Constantine said, Nancy clearly knows more about what’s going on then she’s telling. She’s aware that the Child is after her, but it takes the Doctor to connect the last dots and make everything better for everyone. The Doctor’s sheer bliss at being able to save everybody for once, up to and including the apparently doomed Captain Jack, is a sight to behold. Eccleston definitely gets across the feeling that this is something that hasn’t happened to the Doctor in far too long. One thing I particularly like about Steven Moffat’s episodes, such as this one, is the way he writes Artificial Intelligences. They are often simultaneously clever yet very, very stupid. It’s almost Asimov-like the way these machines, whenever they’re Moffat’s monster-of-the-week, usually are trying to follow their programming in a situation for which is it inadequate. In this instance the nanogenes are doing exactly what they’re supposed to do, but are hampered by both their ignorance of the what humans are and their ignorance of that ignorance. I imagine your review will just go to town on all the ‘dance’ talk between Rose and the Doctor. Personally I found it amusing and it didn’t get overused to the point that it got on my nerves. Like Empty Child, I’m giving The Doctor Dances a 4.1. Previously, I think it was jD that mentioned that Eccleston’s two parters tend to start strong but end weak. I don’t really feel that’s the case here. This episode was every bit as engaging as the previous in my opinion as the mystery unravels and the Doctor saves the day. The big solution for The Empty Child. Rose has some clever moments. Shooting the floor and rewinding it was a cool idea. The music is very good. Great special effects. But to be honest, I don’t like it very much. If I am bored, this episode is not on my short list to watch again. I watch Doctor Who to get entertained and not get depressed.